Expedia's Novosibirsk vacation packages can help you save! Combining your reservations will give you more spending money for your upcoming trip. Look around our international database of more than 400 partner airlines and 321,000 worldwide properties. Too many to select from? Don't stress — we can help you decide! If you have to postpone your travel itinerary, we will honor your cancellation request on nearly all bookings with no added fees. Getting ready to embark on your Novosibirsk vacation? Haven't got a clue what sorts of things to add to your travel program? Don't stress — we'll give you a few hints. The Novosibirsk Zoo and Alexandre Nevsky Cathedral are some of the top sights here. Plan an outing around them and learn what makes them so special! Live theater challenges our way of thinking and asks us to aspire to higher things. Catch a play at Novosibirsk Opera and Ballet Theatre and open your mind to some big ideas. Visitors in this destination have an abundance of choice. Great theater can challenge our assumptions and asks us to aspire to bigger and better things. Catch a show at Globus Theatre and open your mind to another way of thinking. Still have some time on your hands? Public squares have many stories to tell. Wander well-trodden pathways and look for clues to the past at Pervomaisky Square. Before you jet off to Novosibirsk, book a comfortable bed via Expedia. You'll have no less than 27 accommodations to pick from — your next luxury getaway or cheap vacation awaits! Begin your vacation on an extravagant note by slipping between the high thread count sheets at the DoubleTree by Hilton Novosibirsk (7/1 Kamenskaya Street). Alternatively, the Uyutnaya Hotel (Ul. 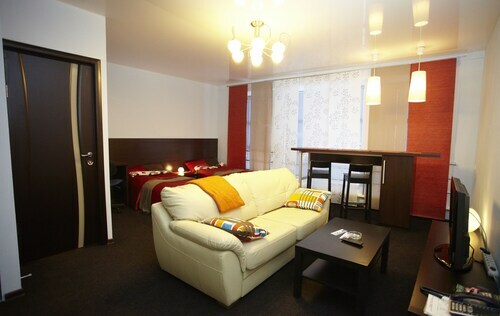 Belinskogo 143) is a great place for the budget-conscious traveler to spend their nights. Nobody likes spending time at the airport. But it's a small price to pay when you think of the incredible destination that awaits! Located 10 miles (16 km) west of Novosibirsk, Tolmachevo Airport (OVB) is the closest terminal. Located in Novosibirsk City Centre, this hotel is within a 15-minute walk of Railwaymen Palace of Culture, Krasny Fakel Theater, and Novosibirsk City Drama Theatre. Novosibirsk Regional Puppet Theatre and Siberian Birch Bark Museum are also within 1 mi (2 km). Sibirskaya Station is 25 minutes by foot. 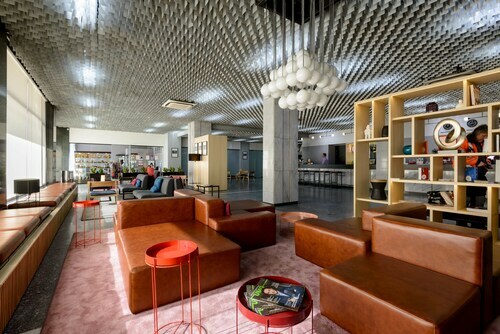 Located in Novosibirsk City Centre, this hotel is within a 10-minute walk of Globus Theatre, Heroes of the Revolution Square, and Pervomaisky Square. Novosibirsk State Museum and Novosibirsk Opera and Ballet Theatre are also within 15 minutes. Sibirskaya Station is 26 minutes by foot. This family-friendly Novosibirsk hotel is located on the riverwalk, within 1 mi (2 km) of Novosibirsk State Drama Theatre, State Public Scientific Technological Library, and First bridge across the Ob. Novosibirsk State Art Museum and Nikolay Roerich Museum are also within 2 mi (3 km). Novosibirsk Yuzhnyy Station is 18 minutes by foot. Located in Novosibirsk City Centre, this hotel is within a 5-minute walk of Krasny Fakel Theater and Novosibirsk Regional Puppet Theatre. Siberian Birch Bark Museum and Novosibirsk City Drama Theatre are also within 15 minutes. Sibirskaya Station is 29 minutes by foot. Located in Novosibirsk City Centre, this luxury hotel is within a 5-minute walk of Novosibirsk Opera and Ballet Theatre and Poteshki Puppet Theater. Theater of Musical Comedy and Lenin Square are also within 10 minutes. Sibirskaya Station is 19 minutes by foot. Located in Novosibirsk City Centre, this luxury hotel is steps from Krasny Fakel Theater and Novosibirsk Regional Puppet Theatre. Siberian Birch Bark Museum and Novosibirsk City Drama Theatre are also within 15 minutes. Sibirskaya Station is 28 minutes by foot. Situated in Novosibirsk, this hotel is within 3 mi (5 km) of State Public Scientific Technological Library, Novosibirsk State Drama Theatre, and Globus Theatre. Traffic Light Monument and Novosibirsk Opera and Ballet Theatre are also within 3 mi (5 km). 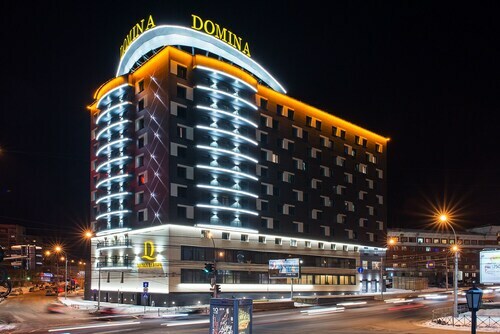 Located in Novosibirsk City Centre, this hotel is within a 5-minute walk of Novosibirsk City Drama Theatre, Novosibirsk State Museum, and Lenin Square. Novosibirsk Regional Puppet Theatre and Pervomaisky Square are also within 10 minutes. Sibirskaya Station is 23 minutes by foot.